Description: It is Winter Carnival time in beautiful Quebec City. The Screech Owls are in town to join in the winter fun and take part in the biggest hockey tournament on earth: the famous Quebec Peewee Invitational. This is where Guy Lafleur, Wayne Gretzky, and Mario Lemieux first showed the world their incredible talents – and now it’s the turn of Travis, Nish, Sarah, and their friends. But the dream trip soon turns into a nightmare. Travis is asked to keep a diary that will be published in one of the big daily newspapers – and a terrible misunderstanding follows. Soon after Travis’s words appear in print, the crowds are booing the Screech Owls, and someone – no one knows who – begins a campaign of terror against the team. The Owls know they are good enough to make it to the final. Sarah could even equal a tournament record set by the great Guy Lafleur! But if the Owls are to stand any chance at all, they must find out who is trying to destroy them. 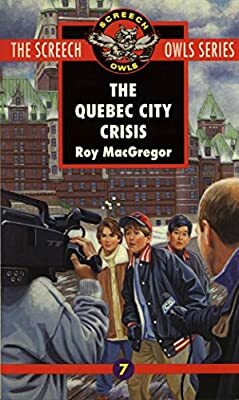 The Quebec City Crisis is the seventh book in the Screech Owls Series.